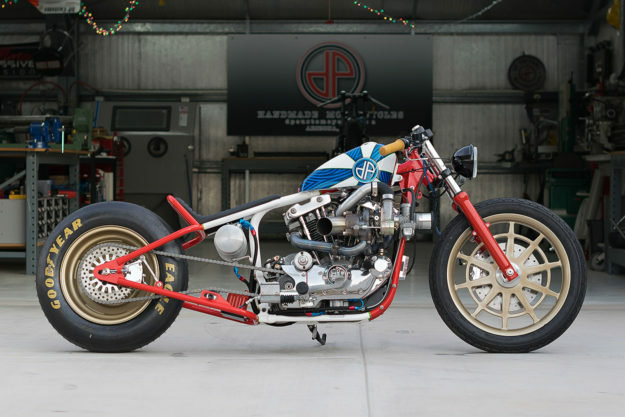 The client roster at DP Customs is slammed. So there’s precious little time to admire a finished project before it goes to its new home. And the Del Prado brothers are sick of it. Adding fuel to the fire was a turbo that Justin had picked up a few years ago. The brothers quickly decided on a direction and got going. 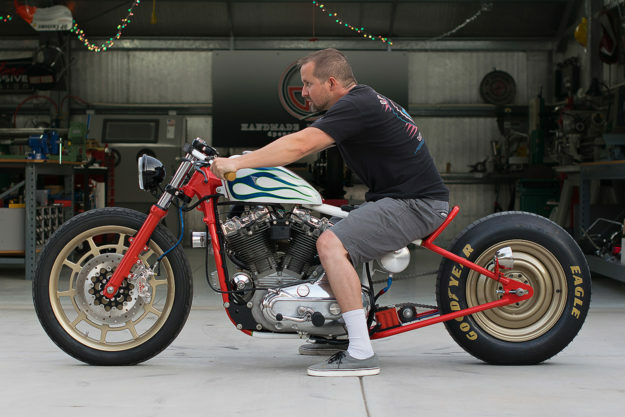 Justin started by fabricating a bobber hardtail with a 6” stretch and 4” drop. As we’ve come to expect from the Arizona workshop, the framework is exquisite. Then it was time to put that turbo to good use. The motor was rebuilt, complete with forged pistons and new valves and springs. 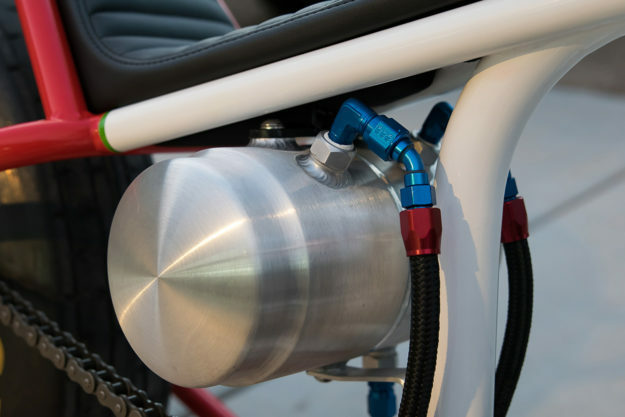 A draw-through setup was decided on for the turbo; the turbo mount, aluminum intake and exhaust system were all hand-made. 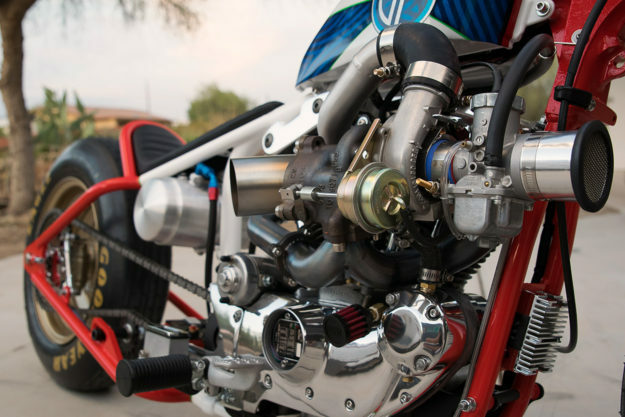 The carb’s a Mikuni—“jetted up to the moon.” DP have used fittings and braided lines from Earl’s throughout the oil system, and tapped into the cam cover for the oil return. The work was extensive, and way above our heads. 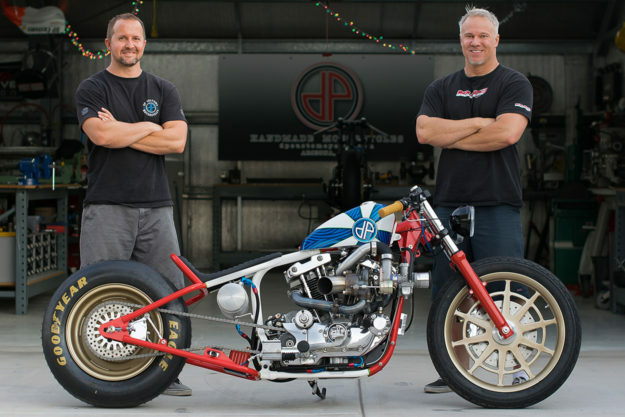 With the heart of the beast sorted, the Del Prados started fleshing out the rest of the bike. The 19” front wheel is their own design, machined by Thomason Performance. 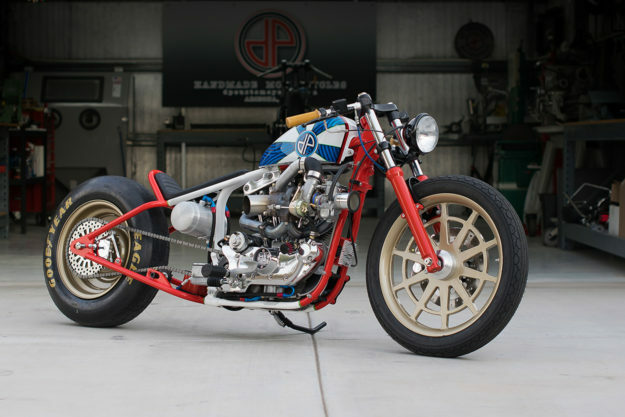 The steel 15×5 rear wheel is from a car, modified to work with a Harley hub. There’s a Brembo brake setup up front, while the rear is stopped by a custom made sprocket and rotor arrangement. The uncompromising new setup called for minimal add-ons, and an extreme stance. Unique Upholstery in Scottsdale did the barely-there seat. Underneath is a Mooneyes oil tank, and a Ballistic Lithium-ion battery. 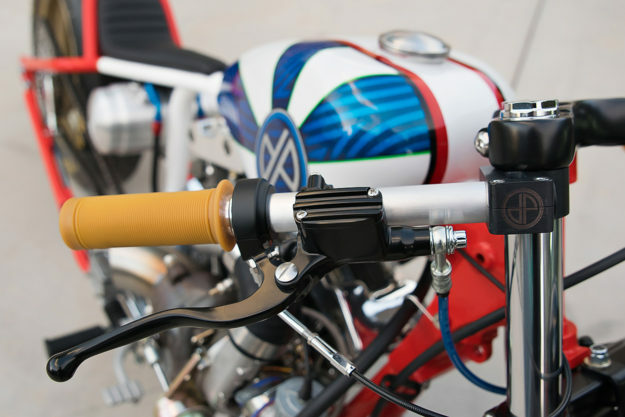 The clip-ons are Chainsikle units, capped with Biltwell Inc. grips. 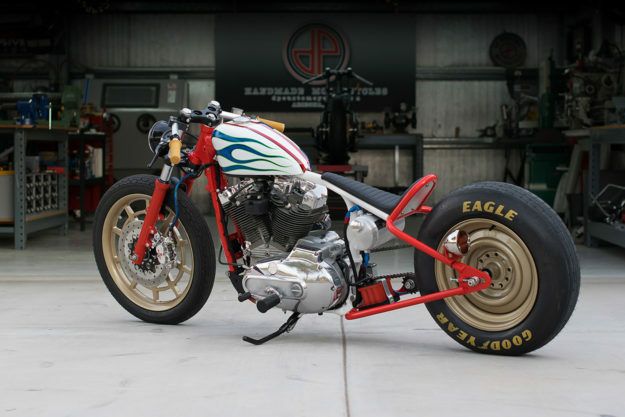 To finish it off, Brandon at Walkers Way Custom Paint has shot the tank with an outrageous metal flake scheme, with red and white for the frame—plus a few discreet green touches. More importantly, Justin and Jarrod finally have some eye candy around the shop. Any bets as to how long before a customer makes an offer on it?